Curtiss Brock is a very diversified glass blower. He has made relatively simple vessels to solid form abstract sculptural pieces. Trained in glass art at the University of Illinois, Champaign and the Pilchuck Glass School in Stanwood Washington, he had his first solo glass exhibit in 1984, the year he received his MFA degree. Brock also has a BFA degree from Goddard College. 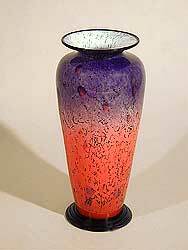 He was originally drawn to glass blowing by his fascination of the technical process. Brock is a regular teacher at Pilchuck Glass School and The Penland School for Crafts and has given numerous lectures in the United States and Japan. 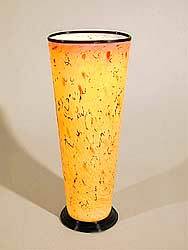 In 1988 he was the recipient of the Shimono Sake Museum Prize at the International Glass Now Competition. Additionally he has been on the receiving end of 2 NEA grants - Southern Arts Fellowship Grant and a Tennessee Arts Commission Individual Artist Fellowship. Mr. Brock has been the head of the glass program at the Appalachian Center for Crafts over 10 years. Much of his previous work has been inspired by rocks and minerals as seen for example in his series of cast bowls, "geodes" and stone groupings. His pieces often appear serene and seamless and encompass his desire to provide a "quiet community on the fragile balance between man and nature. Curtiss Brock's work can be found in more than 20 museum collections around the world.